10th of april in the year 0f 2006 was the first day the students go back to school in japanese education system including for those who went to school for the first time. including my nephew -- masyu. i remember my first day of school like it was just yesterday -- i cried! i was crying hard, kicking and screeming, knowing my parents left me. what a shame! but, surprisingly enough, masyu didn't cry at all when his parents left him. 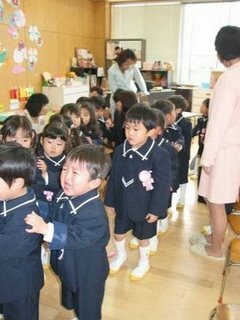 shame on his uncle whose on his first day of school was crying. he was the tallest boy - taller for a 3.5 year old for his age - in his class and proudly said to his uncle that he didn't cry at all. "oom iman, masyu didn't cry, mommy told masyu, oom iman cried!" darn it! like my sister didn't cry on her first day of school!